Patti wrote: Yet, from mostly looking at fingerprints on hands in front of me, I would agree with Richard that the loop with a central triradii is a different creature than the loop with the side triradii. Purkinje placed this pattern between the tented arch and the loop in his set of nine types of prints. Patti, Want to know whether the positioning of the tri-radii on the surface of the fingertip cause any alterations to the energy the owner feels? Request other palm readers here to comment on this question. I think most palmistry authors that have written about the triradius, have referred to them as energetic. Energy centers. It would seem like a deliberate ignoring of the obvious, to classify a pattern with a central triradius along side one with no triradii whatsoever. The classification would be based on seeing the arch evolve to a tented arch formation, but again, classification has little to do with behavior or character. The other view is to see that there is a central triradii and look at what are the implications of that. Patti wrote: I recognize the issues with a printed fingerprint of the loop with a central triradius, especially one that isn't rolled as done by the FBI. Yet, from mostly looking at fingerprints on hands in front of me, I would agree with Richard that the loop with a central triradii is a different creature than the loop with the side triradii. Purkinje placed this pattern between the tented arch and the loop in his set of nine types of prints. - and the differences between arches and whorls is obvious. And I could describe next most sigificant difference as the difference between ulnar loops and radial loops... which are treated in Richard's system almost the same (he uses only a relatively small difference in his 'points' system). But in the perspective of a comparision between ulnar- and radial loops, the difference between a normal loop and a loop with a central positioned triradius (your 'creature') is actually relatively small! And I could here also argue that in many cases of a 'tented arch' it hardly varies from the essence of an arch! Therefore I think the signficance of the tented arch tends to be overestimated, because there are only a few scientific studies which have pointed out that the tented arch could have a significant value regarding diagnostic issues (only in terms of diseases and disorders). So, I think there are plenty of arguments to consider the idea that the tented arch might not be as important to qualify it as a fourth major fingerprint type. By the way, this is also confirmed in the FBI system, where the tented arch only represent a variation of the arch... just like a radial loop is recognized as a variation of the loop! And with all these arguments in mind... I think the principle of the graduated materiality suggests that in a way it doesn't make sense to label a tented arch as the major fingerprint type related to fire - because it often represent only a minor variant positioned between a simple arch and a small loop. Richard system includes the points 1, 2 and 3; and in Elemental Chirology includes 1, 2 and 4 (though in Elemental Chirology the elongated whorl is described as 'air and water' + the whorl with a double loop inside is described as 'air and fire'... so this illlustrates that the most complex fingerprint patterns tend to be associated in the elemental system with a combination with the element air!). Patti, beyond my earlier response... I also would like to add that I think Purnkinje's third example can basically be described as a small loop (where the exact position of the triradius is probably quite irrelevant). So, I don't recognize a direct connection between Richard's approach for the tented arch and Purkinje's model. In the original translation done by Cummins and Kennedy in "Dermatoglyphics, Science in Transition", it's translated as a oblique stripe. The original sketch by Purkinje found in "Purkinje's Vision" is more obviously a central triradius. The drawing here is a drawn copy and I've noticed that these 9 are not exactly like Purkinje's originals. Cummins & Kennedy add their own note that it would be a "loop, ulnar or radial" - but that is not what Purkinje said or illustrated. He describes it as "a single oblique line is interpolated from one side to the other; it runs forward (distally) and ends almost at the center." (Wentworth & Wilder later in 1918 pointed out the difference between ridges that touched/connected at their ends but did not actually form a recurve) Purkinje's definition for an actual loop becomes more complex "Now if this oblique stripe by a simple curve, an oblique loop is formed, which may be more or less erect or may bend forward. Near its base, on one side or the other, a triangle is formed from the different directions of the rugae and sucli"
Patti wrote: In the original translation done by Cummins and Kennedy in "Dermatoglyphics, Science in Transition", it's translated as a oblique stripe. The original sketch by Purkinje found in "Purkinje's Vision" is more obviously a central triradius. The drawing here is a drawn copy and I've noticed that these 9 are not exactly like Purkinje's originals. Patti, I think Purkinje's use of the word 'almost' is essential here; because that word suggests that one can not define the exact location precisely. And in any small loop the location of the triradius will usually be close to the center; but I have never ever seen any specific criterium for discriminating a 'trentral triradius' from a 'not central triradius'. And thus I think it is likely quite impossible to define such a characteristic precisely. It might be interesting to note that in hand shapes the predominate elemental shape is commonly accepted as Fire. The loop is the most commonly found fingerprint pattern (about 60% for all digits combined) and that has been related to Water in the elements. If loops are predominate and fire shape hands are predominate - it's interesting to think how loops became associated to water and short middle finger to palm ratio became associated with fire. Are you saying that - you're agreeing on the classification which RU is doing, but, not the interpretation of it? Did Purkinje wrote anything about the interpretation along with the classification( keeping such a pattern b/w TA and loop )? I think, here you're writing about TA and Arch classification and not about TA and UL classification. Why is that a classification has little to do with behavior or character? 'coz, based on the classification, we would be able to identify the behavior of the person. So, how is classification not related to behavior? Kiran, I think you and I have a likewise perception regarding the problem you that you spotted in the first post. I only think that we should also consider the possibility that Richard and Baeth may not be aware of each other's view point regarding how to connect the fingerprints with the elements. Do you think you need more detailed info Kiran? PS. Sorry, I don't understand your comment regarding the logics about how things get on paper; because the 'pushing' on a fingertip will always be decisive for how the fingerprint will get printed on paper. No Martijn, if it is not essential here then the info is not required. Regarding my comment, What you said was - "because Richard's so-called 'advanced' method for the tented arch can by principle only be applied to the hand directly because the rotation of the finger gets involved... which implicates that one can not apply this to fingerprints on paper "
My doubt was - "Logically, it should be the other way round, that the TA should be possible to be applied(identified) on paper and not on the hand. As on paper, it would appear correctly(as the hand would be placed in 90 degrees) against paper!". Is my qtn clear now? Yes Kiran, I understand what you are saying. But I think I have to disagree regarding your suggestion that paper represents a more reliable result - because the 'shape' of any fingerprint on paper will never be exactly the same. - AND/OR... via a photoscan! So, the result of all 3 methods should by principle be the same; and if not... then I would advice to make a new assessment via both methods in order to find a likewise result! Okay, I get your stand Martijn. I think narrowing the categories down to 4 or 5 is convenient for the FBI and then becomes also convenient for systems that use 4 or 5 elements/aspects to associate their elements to the prints. I would imagine if there were a system in place that assigned planets to fingerprints, they would find an even larger number more convenient. It's all about associations with systems. In the 1800's Purkinje was leaning in the direction that the visible physical aspects were a reflection of the hidden internal workings. By the twentieth century the main interests were genetics, eugenics and identification, not behavior. The forensic community ruled and guided the direction of the science of fingerprints away from the senses toward classification for identification. There were authors that leaned toward the behavior side such as Walter Kidd and I think Harold Cummins had an interest there, too. But going down that avenue seemed frowned upon. The method, it seems, to bi-pass this obvious discrepancy is to refer to the number of triradii. Central triradii are most common with a tented arch, but also with a small loop that typically remains on either the radial or ulnar side of the fingertip. In the FBI rules, there are provisions that make it difficult to classify these as loops so they become tented arches by default. The classifications used by the FBI do closely follow developmental aspects which makes them very useful for identifying and categorizing the fingerprints, but not for psychological purposes (in my opinion). Patti, what do you exactly mean with "narrowing the categories down to 4 or 5"? 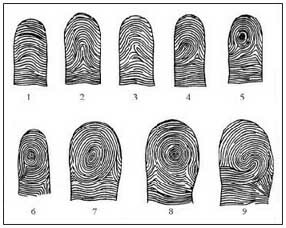 We can observe that the FBI has narrowed down fingerprint classification to only 3 major categories (arch, loop & whorl), which each get sub-divided into 2 to 4 sub-categories. Which results in the 8 major types: (1) arch + (2) tented arch, (3) ulnar loop + (4) radial loop, and (5) plain whorl + + (6) central pocket loop, (7) double loop + (8) accidental whorl. Each of these categories & types have their own unique charateristics in terms of the amount of triradii, amount of cores, and the other criteria being used. However, in Richard's definition for the tented arch there is no longer any 'true' difference between what he calls a 'loop' (which are featured with a triradius far away from the central zone of the fingerprint) and his loop-variant of the 'tented arch' (featured with a triaradius more close to the central zone of the fingerprints). Since one can not precisely define the central zone of in any fingerprint (not even directly via the hand)... I think there is no solid basis for his assessment method. And thus any attempt to research the validity of his assessment method can only result in subjective validity. So in my view it is rather problematic that Richard's method includes a self-invented criterium (the precise location of the triradius) that only plays a role in the classification of the loop and the tented arch. Because this makes the terminology of his system incompatiable with the FBI system... and I think it is said that his students do not appear to be aware of this. For example: Richard's students appear to use a criterium suggesting that the tented arch can be seen in about 2% of fingerprints, an arch in about 3% of fingerprints, a whorl in about 30% of fingerprints, and a loop in about 65% of fingerprints. But according the criteria presented by the FBI system the tented arch is actually close to 10 times more rare than the arch, and the percentages are known to vary significantly among the populations around the world. So, despite that fingerprint assessment is known as an objective science (featured with well-defined detailed rules and guidelines)... I observe that Richard's method does not qualify as such. PS. Richard's criterium regarding the location of the triradius could have made sense if his system had included some kind of principle where the tented arch had been positioned BETWEEN the ulnar loop and radial loop... because those are the only two fingerprint types where the location of the tiradius truely matters (but only relative to the location of the thumb/pinky... not to the finger itself!!!). But in Richard's point system for fingerprint ranking he almost treats the ulnar loop and radial loop likewisely (with only a tenth of a point difference)... even though the 'fingerprint family tree' (see picture below) shows that the are actually located between the ulnar loop and radial loop. And thus these 'loop variants of the tented arch' actually represent a category that is more closely related to the loop than the (true) 'tented arch', which implicates that from a fundamental point of view the FBI system is likely more accurate (than Richard's approach). PS. Richard has presented the 'fingerprint family tree' in his book but... but it appears that he never studied it properly; because it clearly shows the patterns which I have just described: the 'tented arch' (see example 30, 31 + 38) and the 'loop variants of the tented arch' (see example 25) are not really directly related... because only the 'tented arch' is located between the 'arch' and the 'loop', and the 'loop variants of the tented arch' is located between the ulnar loop and the radial loop. Which implicates that one could argue here that one could easily argue that there is actually another fingerprint type between the 'tented arch' and the 'loop variants of the tented arch'... just like the 'ulnar loop' and 'radial loop' could also serve as connecting types between the 'tented arch' and the 'loop variants of the tented arch'. And thus the essence is that the 'loop variants of the tented arch' is not located between the loop and the arch... which shows how the fingerprint family tree fundamentally PROOFS that Richard's approach does not make sense! Maybe the ulnar and radial loop could be associated somehow with the rising and falling tides of the sea (water); water usually spreads itself... however, the moon and the sun exert forces that make water pull back. This pull-back energy can be associated with the radial loop. From a genetic point of view, I think one can only understand the nature of the radial loop in the perspective of the 10 fingerprints together. A radial loop on the index finger can potentially have positive implications... but when it is only found on one of more of the other fingers it usually gets associated with troubles (not rarely featured with genetic abnormalities). I saw that after I posted and meant to change the sentence but apparently got sidetracked and haven't visited this thread since. I must have been thinking about the sub-categories tented arches or accidentals or the elements with the 5th element ether. I did the same thing another time when mentioning the fbi's list, don't know why. Double loop energy personality wise would fit that ebb and flow description better than any kind of fire energy. Where is double loop on family tree of fingerprints? I can't find one. (edit PS) I had missed Patti's previous post about double loops, she wrote it while I was studying the fingerprint family tree. Well yes, I understand your association. But I am not able to fit in this association in an attempt to find a parallel between the fingerprint family tree and the principle of the graduated materiality. If the arch relates to earth, the loop to water, and the whorl to air... then one can expect to find fire located between the loop (water) and the whorl (air) - according the principle of the graduated materiality (which goes via the order: earth - water- fire - air). I'm not sure in what way you are trying to apply graduated materiality to fingerprints? Look at how the prints manifest in human behaviour terms. Fire creates change. Double loops are very changeable but they are too indecisive to initiate change, whereas tented arches are more likely to initiate change. Some whorls also create change. I have never considered before the aspect of double cored whorls being fire, Though I have always considered that whorls can sometimes have fire and sometimes air characteristics. No 10 has all characteristics of a double loop (two deltas + two seperate loops, each featured with a seperate set of shoulders). Thanks, yes I thought no 10 was probably a double loop but it is not typical in appearance of most double loops that we see, where two loops curve around each other (like a yin-yang sign!). I'm not sure in what way you are trying to apply graduated materiality to fingerprints? are you talking about ridge count..or what?? Yes Lynn, I understand your point regarding how those loops curve in no.10 (which also relates to the locations of the triradii, etc.). Regarding your PS, basically I only have the order of the 4 elements in mind (earth - water - fire - air... or in the perspective of evolution maybe I should instead use the order: air - fire - water - earth). 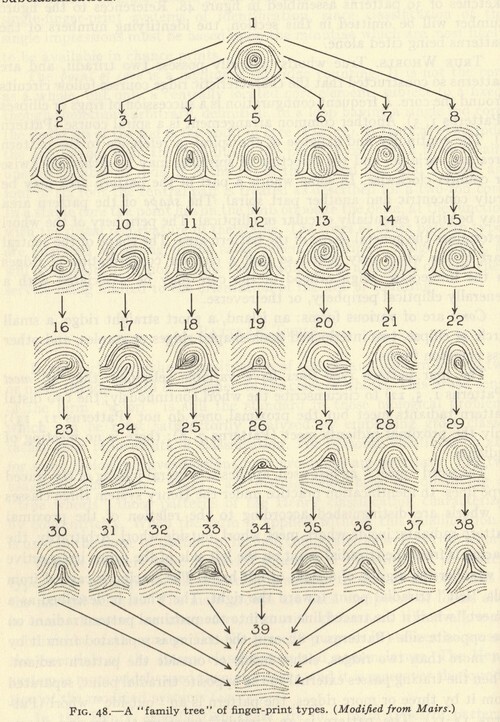 Though many hand readers tend to 'value' the whorl as the most interesting fingerprint pattern... Cummins & Midlo actually have described the whorl to represent the most 'primitive' fingerprint pattern (and the arch to represent the least 'primitive' pattern, with the loop in between (see page 264 in 'Finger Prints, Palms and Soles'). And I think we can understand their view in the perspective of the fact that nearly all primates tend to have more whorls than us humans (see page 174 in their work). However, interestingly, this could implicate that one might also consider to recognize the whorl as the most crystalized fingerprint pattern... and thus one can also associate the whorl with the element earth; in such a perspective one can associate the NON-crystalized arch to represent the element air (and the loop would then continue to be associated with water, and in this perspective one could associate the tented arch with... fire!). Again, this is just a thought to illustrate that according the rules of primate-evolution one can find a different set of rules... parallel to the fact that the simian line has a primitive nature which explains why it got associated to represent a 'minor physical anomaly'. So, it appears that choices regarding how to connect the four fingerprints with the four elements very much depend on which 'philosophy' one has chosen to use (in general, I find the philosophy of 'evolution' most appealing... so I very much value the perspective presented by Cummins & Midlo). Could you describe how you are using the terms "advanced" and "primitive" here, because I don't think it's the same as how Cummins & Midlo use it? I think advanced is used to mean the pattern and the volar pad change little between fetal stage and adult and primitive means that the pattern formed on a different shape volar pad from fetus to adult. On humans whorls form in their primitive state on raised mounts that are less raised after ridge formation, and arches form on flatter surfaces that remain about the same after formation. In "Dermatoglyphics in Primates" they say "We are, however, entitled to consider the most highly developed patterns as primitive in the sense that they express the maximum degree of fetalization of the pads which are responsible for their production." Patti, I haven't used the word 'advanced'. I also wonder about what made you think that I used the word 'primitive' different than Cummins & Midlo? "With regard to finger prints it may be concluded that the sequence whorl-loop-arch represents successive departures from the primitive." "Whorls and whorl-like patterns are associates of the primitive conidition of the pads, while patterns of lesser complexity and open fields accompany states of regression of pads. In terms of pattern intensity, higher values thus indicate primitiveness"
So, they use the word 'primitiveness' in the context of development: the (complex) whorl patterns represent a 'basic' or 'generalized' state, and the (less complex) arches represent a next stage in development. PS. Be aware... their population statistics on page 260 and 261 suggest that in populations displaying a low fingerprint pattern intensity (such as many african populations) typically tend to have a relatively high palmar pattern intensity; and populations displaying a high fingerprint pattern intensity (such a many asian populations) typically tend to have a relatively low palmar pattern intensity. So, I think it could turn out to be important to focus on both the fingerprints and the palmar patterns in order to study things properly. Yes, it's more about the condition of the volar pad than the pattern. Their other book has a chapter on this subject entitled "Criteria of Primitiveness and Modification". I would add that this creates a contradiction to the newer science that attempts to claim that the volar pads do not regress but that the surrounding area grows to meet the swollen pad. I haven't taken on the newer viewpoint as factual, yet. I found a link to the text. The page is formatted poorly, but if you scroll almost to the bottom you'll find the chapter I mentioned above at the number "161"
Patti wrote: Yes, it's more about the condition of the volar pad than the pattern. Their other book has a chapter on this subject entitled "Criteria of Primitiveness and Modification". Well, volar pads represent where their perspective starts indeed. However, if one starts considering the fact that the ulnar side of the hand tends to be more developed in primates (especially the 4th digit plays in important role, because in prosimians it is even longer than the 3th digit)... and if one combines this with the fact that whorls are in general much more common in the hands of primates (especially in the lower primates: the prosimians & monkeys, though whorls are also more common in apes than in us humans) ... then one can understand why whorls are most commonly seen on the ring finger: both the ring finger and the whorl can be recognized to represent some kind of 'primitive' component! And... in this perspective one can also understand understand why arches are more likely to manifest on fingers on the radial side of the hand. That's quite amazing... I never realised this untill now! PS. This pattern is also seen in the palm, because in all populations around the world one can observe a tendency for palmar patterns to manifest most likely in the zone between the pinky and ring finger and/or in one of the other 2 'ulnar' interdigital zones (the zone between the ring finger and middle finger or the hypothenar.